So…I have tried to share my knowledge on what suit / shirt / tie combinations you could potentially mix and match with your wardrobe. Now let’s take a look at a few celebrities who have completely got it wrong! I mean seriously, they have to have been inebriated! As if ‘The Hoff’ from Baywatch glory was not getting enough love, we now have to contend with this? 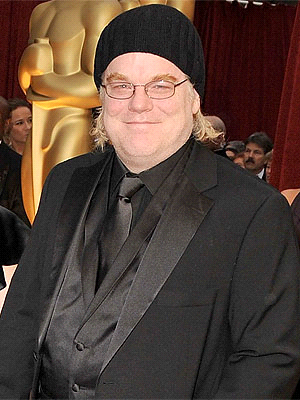 We all love Philip Seymour Hoffman. I think he’s one of the best actors of his generation – from Capote, to Along came Polly, to Doubt, to Before the Devil knows your Dead, to Charlie Wilsons War, he has been sensational. However, not so much with his trip to the Oscars. As his character in Along Came Polly would have said when clanking ball after ball on the hoops court ….”Raindrops!” You don’t wear grey on black on grey! Remember, we need to balance and harmonize colors…always try and balance out warmer and cooler colors, and if there’s a neutral like a grey in there, balance it out with a blue or pink…NOT…more black and grey! Oh…and please….drop the bini when you are wearing a suit! And sometimes, it’s not about what you wear, but the person wearing the clothes that matters, or rather, as in this case, doesn’t matter. If you’re a Ricky Martin fan, which I’m assuming only the male readers of this blog are – I apologize if I’ve offended you. Any suggestions for future content, humorous or substantive, please feel free to comment!